“The Brick Group” as used herein includes The Brick Ltd., The Brick Warehouse LP (including its general partner), United Furniture Warehouse LP (including its general partner), United Furniture Warehouse (a division of The Brick Warehouse LP), The Brick SuperStore, The Brick Mattress Store, Trans Global Warranty Corp., Trans Global Life Insurance Company, Trans Global Insurance Company and Trans Global Distribution (a division of The Brick Warehouse LP). This Website is operated by and is the property of The Brick Group. The domain name, trademarks, trade names, copyright and other intellectual property of thebrickgroup.ca, thebrick.com, ufw.com (collectively the “websites”) and The Brick® are owned by The Brick Group, its subsidiaries or affiliates. The Brick Group expressly reserves all intellectual property rights in all text, programs, products, processes, technology, content and other materials which appear on this Website. Access to this Website does not confer, nor shall such access be considered as conferring, upon anyone any license under any of these intellectual property rights. Access to this Website does not authorize anyone to use any of The Brick Group's name, logo, mark or any other intellectual property in any manner. Desjardins Group is the underwriter of the Credit Card. The Brick Group's Fulfillment System means The Brick Group's software commonly called the 'Brick Retail System', its warehouses, logistics, procedures and know-how, and other assets that establish and maintain its ability to acquire, deliver, and warehouse the products it sells. The Brick Group's Payment System means custom point of sale system and its methods, procedures and technology used to fund consumer sales as currently used in its retail business in Canada. This Website and all its contents are intended solely for personal, non-commercial use. You may download or copy the contents and other downloadable materials displayed on this Website for your personal use only. No right, title or interest in any downloaded materials or software is transferred to you as a result of any such downloading or copying. You may not reproduce (except as noted above), publish, transmit, distribute, display, modify, create derivative works from, sell or participate in any sale of or exploit in any way, in whole or in part, any of the contents, this Website or any related software. The content and software on this Website may be used only as a shopping resource. Any other use, including the reproduction, modification, distribution, transmission, republication, display, or performance, of the content on this Website is strictly prohibited. The Brick Group reserves the right to limit quantities, refuse orders, terminate accounts, and/or cancel orders in its discretion, including, without limitation, if The Brick Group believes that customer conduct violates applicable law or is harmful to the interests of The Brick Group or any third parties. All sizes quoted are approximate. The delivery policy outlined on this Website applies to addresses located in Canada only. The Brick Group reserves the right to use third party carriers at its sole discretion and without notice to the customer. If products are purchased for delivery outside of Canada, the customer must make their own delivery arrangements. Some items shown may require assembly. In its sole discretion, in addition to any other rights or remedies available to The Brick Group and without any liability whatsoever, The Brick Group at any time and without notice may terminate or restrict your access to any component of this Website. We have made every effort to display as accurately as possible the colors of products that appear on this Website. However, as the actual colors you see will depend on your monitor, we cannot guarantee that your monitor's display of any color will be accurate. The Brick endeavours to provide current and accurate information on the Website. However, misprints, errors, inaccuracies, omissions (including incorrect specifications for products) or other errors may sometimes occur. The Brick cannot guarantee that products and services advertised on the Website will be available when ordered or thereafter. The Brick does not warrant that the content of the Website including, without limitation, product descriptions or photographs, is accurate or complete. The Brick reserves the right to: (a) correct any error, inaccuracy or omission at any time without prior notice or liability to you or any other person; (b) change at any time the products and services advertised or made available for sale on the Website, the prices, fees, charges and specifications of such products and services, any promotional offers and any other Website content without any notice or liability to you or any other person; (c) reject, correct, cancel or terminate any order, including accepted orders for any reason and (d) limit quantities available for sale or sold. The advertisements on the Website are invitations to you to make offers to purchase products and services on the Website and are not offers to sell. All prices and other amounts appearing on the Website are quoted in Canadian dollars. Prices posted on this Website may differ from those posted in stores owned and operated or franchised by The Brick Group. For all of the 'Do not Pay' offers on approved credit (O.A.C.) only on your Credit Card, any delivery charges, applicable taxes, and administration fees are payable at the time of purchase. The remaining balance is due at the end of the no interest period. Please refer to your Cardholder Agreement for details relating to use of the Credit Card. Some restrictions and conditions apply to all offers. Please call 1-800-97-BRICK for complete details or visit any location of The Brick Group. 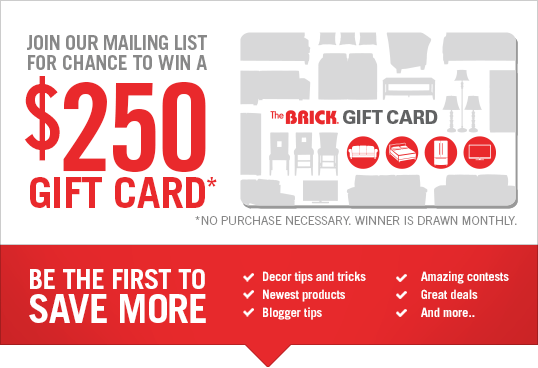 The Brick Group offers limited-time sales values, special buys and items. Due to competitive market pressures, prices are subject to change. The Brick Group reserves the right to correct, at any time, any pricing errors and to refuse to complete a sale that is the subject of a pricing error. The Brick Group charges provincial sales tax in every province as applicable to avoid the need for customers to conduct a self assessment as required by Provincial governments. Except as explicitly provided in the foregoing paragraphs, The Brick Group makes no representations or warranties of any kind, express or implied, regarding the websites and/or any materials provided on the websites, all of which are provided on an "as is" and "as available" basis. The Brick Group does not warrant the accuracy, completeness, currency, reliability or suitability of the operation of the websites, or any of the content or data found on the websites, and expressly disclaims all warranties and conditions, including implied warranties and conditions of merchantability, fitness for a particular purpose, title and non-infringement, and those arising by statute or otherwise in law or from a course of dealing or usage of trade. The Brick Group is not responsible for late, lost, incomplete, illegible, misdirected or stolen messages or mail, unavailable network connections, failed, incomplete, garbled or delayed computer transmissions, on-line failures, hardware, software or other technical malfunctions or disturbances or any other communications failures or circumstances affecting, disrupting or corrupting communications. The Brick Group assumes no responsibility, and shall not be liable for any damages to, or viruses that may infect your computer equipment or other property on account of your access to, use of, or browsing on the websites or your downloading of any materials, data, text, images, video or audio from the websites. In no event shall The Brick Group be liable for any injury, loss, claim, damage, or any special, exemplary, punitive, direct, indirect, incidental or consequential damages of any kind (including, but not limited to lost profits or lost savings), whether based in contract, tort, strict liability, or otherwise, which arises out of or is in any way connected with any use of the websites or content found herein, any failure or delay (including, but not limited to the use of or inability to use any component of the websites for purchases), of the performance or non performance by The Brick Group, even if The Brick Group has been advised of the possibility of damages by such parties or any other party. You shall indemnify and save harmless The Brick Group and its officers, directors, trustees, employees, consultants, representatives and agents from and against any claim, cause of action or demand, including without limitation reasonable legal, accounting and other professional fees, brought as a result of your use of the websites. The Brick is committed to treating all people in a way that allows them to maintain their dignity and independence. We believe in integration and equal opportunity. We are committed to meeting the needs of people with disabilities in a timely manner, and will do so by preventing and removing barriers to accessibility and meeting accessibility requirements under the Accessibility for Ontarians with Disabilities Act. These Terms and Conditions, together with those incorporated or referred to herein, constitute the entire agreement between us relating to the subject matter hereof, and supersede any prior understandings or agreements (whether electronic, oral or written) regarding the subject matter, and may not be amended or modified except in writing, or by The Brick Group making such amendments or modifications available to it pursuant to the Terms and Conditions.